I don’t know about you, but I could really use some comfort food this week! The winter blahs are really setting in, and things like pasta, soup and pot pie would really hit the spot right now. 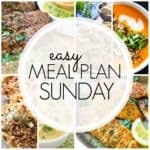 Thankfully this week’s Meal Plan Sunday has got that covered! Chicken and Corn Chowder, Loaded Vegetable Pot Pie, Creamy Chicken Stroganoff…..it all sounds delicious to me. And comforting! Of course, when it comes to comfort food, you can’t forget dessert. And nothing makes me feel better than a warm chocolate chip cookie. Even this week’s new healthier option looks comforting–Thai Curry Red Pepper Quinoa Soup! I can’t wait to try every recipe in this week’s meal plan. I think there’s enough comfort food here to get me through until spring!